My neighbour Jo liked my domino covers but wanted something round. I had a few perspex coasters that needed some tlc. Once sanded, and painted they offered a lovely smooth surface to stamp on. It was a bit hit and miss with the one on the left as the stamp I used is oblong! 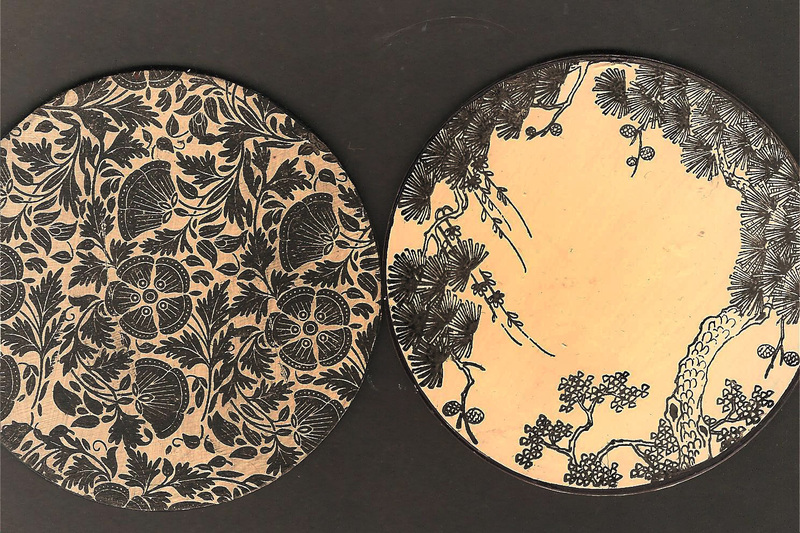 The oriental tree design was a round stamp. I'm hooked on these too now and found a box of 11 coasters in the charity shop today for just a £1 - yipee! WOW, Penny, these are totally awesome! I love re-purposing coasters! These look really cool. these are gorgeous and a little bit of recycling to boot - love it! Ooooh, it's that black and cream combo again! Love these coasters, Pen - great stamps used on them. Good to see you getting into the craftin' groove again. these are terrific! are these wooden coasters? i love the dominos also? and you sand them, and then paint them with buttermilk emulsion paint? can you tell me more about what this is? and do you seal the pieces with something? i work with wooden boxes, and i can totally see several applications for this process. Lovely stamping Pen! Hope we can get together soon, for a little craftyness! Don't forget I have your mag, friday's good!